Today is a very solemn day for me for many reasons. It is Easter Sunday, March 16, 2017. Today also marks the second anniversary of my mother’s passing. I was responsible for my mother’s care for 10 years. It started when she had a stroke when she was 86 years old. No one wants that call at 3 am or at any time. After months of rehabilitation she was ready to return home. 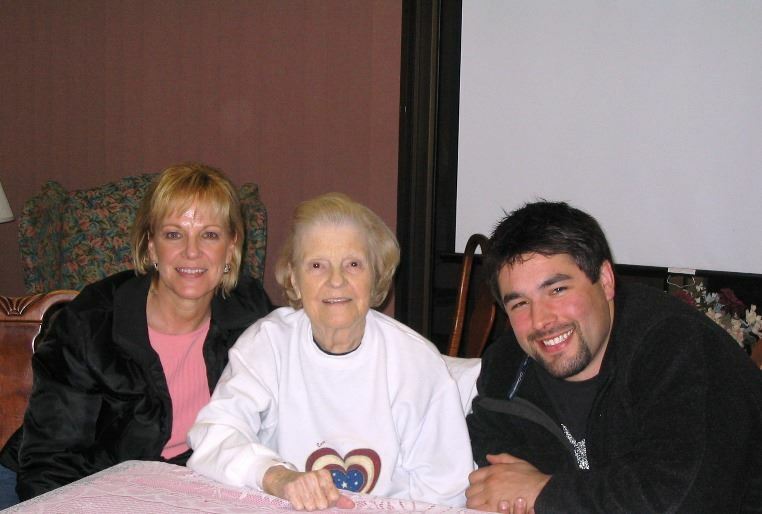 The photo below was taken on my mother’s 87th Birthday. We celebrated in the skilled nursing facility where she resided. The photo is of me, my mother, and my son. The day I was scheduled to pick my mother up and bring her home was the day she fell and broke her hip. Off to the emergency room she went. It was truly an uphill battle from there. She was never able to return home. She spent the next nine years in a skilled nursing facility. To say that she did not like living there would be a gross understatement. No matter how “nice” a skilled facility is or how nice some of the care givers are … things happen. My mother was injured while the caregivers were putting her back into bed. That resulted in an infection in her leg. The doctors wanted to amputate her leg. Thankfully, I had Durable Power of Attorney and I said … No Way. My mother still had capacity at that time. She did not want any more surgeries. Either way they would need to do surgery either by amputating her leg, or doing skin graft surgery, which is what they did. My Mom did not really have it in her to undergo rehabilitative therapy again after the skin graft surgery. She did not want to get out of bed and do “all of that work” again. She begged me not to make her go through it again. As odd as it may seem, making these decisions on her behalf were easy. My mother made it perfectly clear to me what she wanted done, and not done, when she gave me Durable Power of Attorney. I was not making the decisions for her. I was honoring the decisions and choices she made when she was healthy and vibrant. As time marched on dementia began to march its way into my mother’s life. There was no stopping it. It was difficult to watch and emotionally challenging for me to deal with. The photo below means the world to me. It was the last time I was with my mother and she still recognized me and knew who I was. It was taken in November 2014 on Thanksgiving day. Those big brown eyes of hers locked into my eyes as she got a big smile on her face and said “You are my Kathleen.” She was so confused she thought my eldest brother was her husband. She would ask me how my Dad was doing. My father predeceased her 20 years earlier. Shortly after my mother’s 96th birthday in February 2015 she lost interest in eating. No forced feeding or feeding tubes for her. That was not what she wanted. She continued to lose weight. The dementia created more confusion. In April 2015 I knew it was time. 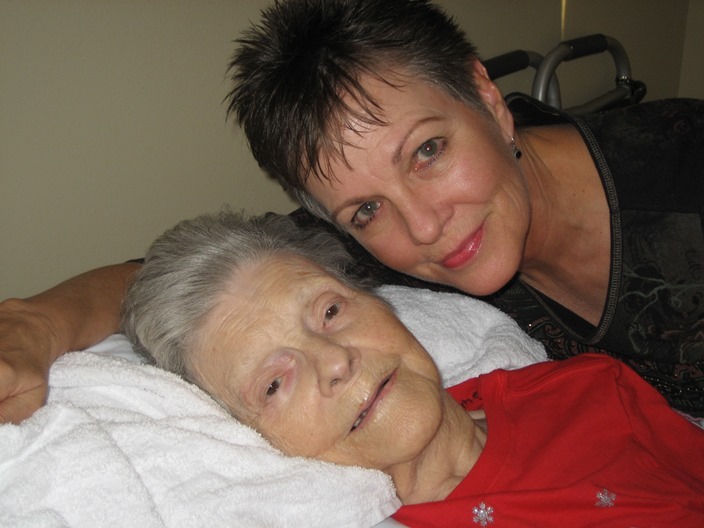 I did not hesitate in making arrangements to have her moved to an exclusive hospice care facility. I have so much respect and gratitude for the hospice nurses and staff. Within 3 days of her arrival my mother passed away peacefully. She was ready. She died with dignity and grace on April 16, 2015. A numbing feeling set inside of me. With no time to truly mourn and grieve I found myself dealing with funeral arrangements and administrative matters such as bank accounts, social security, pension payments, etc. Overwhelm became the overriding emotion. Life does not stop to allow us time to mourn. Life does not stop when we feel grief. Life expects us to carry on. After all, life is for the living – right? I had no idea how much I would miss my mother. I did not know it was possible to feel the emotions I felt. There are no words that can explain the tiny hole in my heart. That hole, that space, belongs to my mother. It is hers and hers alone. No one or nothing can fill it. The photo below is at the private memorial I had. I wanted to spend time alone with my Mom at a place that is very special to me. It is on the beach in Half Moon Bay. I needed to do something private and alone. Even though she had passed and her body was cremated, there were still some things that needed to be said. Privately. Alone. My relationship with my mom was incredibly special. I was the youngest of 6 children. My focus for so many years was on ensuring she was well cared for. Today, Easter Sunday, 2 years after my mother passed away, I still miss her. My love for her is stronger than ever. My appreciation and gratitude for her, what she taught me and the strength she created in me continues to grow. Following the passing of my sister in April 2014 and my mother in April 2015, specializing as a probate agent became my calling.While I had managed probate sales from the beginning of my real estate career in 2003, somehow the specialization chose me. Be it a gift from my mother or a calling, I cannot imagine not reaching out and helping people who are grieving the loss of a loved one. Losing a parent, a loved one, a dear friend, is life-changing. I am forever changed by the loss of many.